Chandigarh 11th June:- Having carved a distinct niche for itself in the last four decades globally in the field of Homeopathy, Dr Batra's Multi-Specialty Homeopathy Clinics today revolutionized the future of healing by launching Dr Batra’s GenoHomeopathy, a revolutionary and path-breaking gene-targeted homeopathic therapy that is scientific, precise, safe and uniquely planned for individuals for the first time in India. Dr Batra’s GenoHomeopathy is a new age customized treatment. It is genetically personalized homeopathic care that involves designing a treatment based on individual genome sequencing. It combines personality and genetics for scientific and targeted treatment. It is a personalized treatment, as no two people on this planet have the same genes. Genes of every person are as unique as his finger print or iris. Therefore, unlike the conventional treatments currently in practice, which are one size-fits-all, with Dr Batra’s GenoHomeopathy, no two patients with even the same medical condition will be given same medicines. Medicines will be given based on their genetic make-up, and will be as unique as every individual, so that the medicines work more effectively for every patient. Addressing the media, Dr. Akshay Batra, Vice-Chairman and Managing Director, Dr Batra’s Healthcare, said that through GenoHomeopathy, we are revolutionizing the future of healing. Dr Batra’sTM has always been at the forefront of technology, research and futuristic evolving therapies. By launching GenoHomeopathy, we have tried to bring to our patients a technologically superior treatment, which is not only customized and focused but also cost-effective. Research studies have indicated that homeopathic medicines have the ability to correct any underlying illnesses without side-effects. Dr Batra’s GenoHomeopathy goes to the root of the problem; right to the patient’s genes and treats it with precise and unique homeopathic medicines. As the root cause of the medical problem is treated, the patients not only get relief from unpleasant symptoms but a long-lasting cure for their medical condition. GenoHomeopathy tests are designed by Dr Batra’s team of medical experts in conjunction with specialists in genomics and specialist consultants in the field of medicine. These tests are designed based on the vast experience of treating 15 lakh patients at Dr Batra’s Multi-Specialty Homeopathy Clinics for the varied disorders including Allergies, Child Health, Hair loss, Preventive Health (Male/Female/Child), Skin Disorders, Stress, Weight Management, Women’s Health and Sexual Health. Patients can therefore target a whole gamut of ailments with this simple, genetic test that is painless and cost-effective, and is available at all Dr Batra’s Multi-Specialty Homeopathy Clinics Pan India. 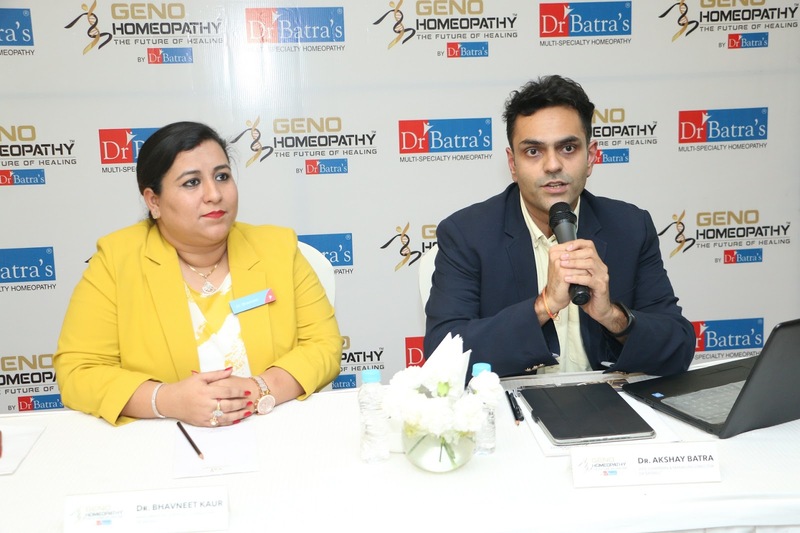 Dr Batra’s GenoHomeopathy test will also help patients know if they are at risk of getting a medical disorder in future, which means it can assess the hidden risk of a medical problem even before the symptoms appear or the blood tests reveal an underlying illness. It therefore gives patients anopportunity to prevent and treat lifestyle diseases. Dr Batra’s Multi-Specialty Homeopathy Clinics will also create a bank of patients’ genomic data called GenoHomeopathy Bank. This genomic data will be used to predict which treatment option is likely to be most effective for patients or how they are likely to respond to any treatment in the future. It will also help derive better treatment results for other patients, as the test will help the doctors treat the associated complaints of a particular disorder. It will help them analyze which homeopathic medicines best suit a particular genetic make-up or how patients with a particular disorder are prone to any other health complication (for example, a patient with a skin problem called psoriasis, is prone to have diabetes). With this every patient will have a chance for better and faster healing.